I first saw this work on the pages of Hoopla and loved the juxtaposition so… Let’s just dive in with Sarah Terry of Guerilla Embroidery shall we? I was lucky enough to study at a school with an amazing art department, and started using machines for free motion embroidery at 16. I then studied on the Art Foundation course at Leeds College of Art and Design, where I got a chance to try my hand at other disciplines. Although it was only an 8 month course, I was prolific (producing over 30 sketchbooks!) and my time there really helped identify textiles as the path I should pursue. I then studied on the Embroidery course at MMU (Manchester Metropolitan University) for 3 years, graduating in 2006. My current work explores the idea of ritual through the use of hand embroidery. I am also exploring the way in which scale can impact on the final piece. One of the series that I really love is “Home invasion” in which you embroider spiders, bugs, and small pests onto found vintage linens: can you talk about how you came to this work? The idea for ‘Home Invasion’ began when I was on a year long residency at a school in Australia. I’m not usually scared of spiders or other creepy crawlies, but in Australia those things can kill you! This body of work was a humorous way of dealing with these fears. The op shops (charity shops) in Australia are amazing, and they were full of these hand embroidered linens. I had set myself the challenge of only using materials found in the country when I moved there, and the use of the linens not only linked nicely into this wish; but also strengthened the concept behind the embroideries in the first place. It allowed me to create the juxtaposition between the original cutesy, flowery stitches and my own embroideries. For your solo show “drawing threads” you say the work is about the passage of time, can you talk about how these works reflect that and what about this inspires you? When I spoke about the work reflecting ‘the passage of time’, I was literally referring to the amount of time which is takes to hand embroider. My work for this show was created completely by hand, which allowed me time to meditate on the meanings of the work and the experiences that may have led me to that point. Although they never made it into the show, I did several embroidered ‘diaries’ which allowed me to cement certain memories in my mind. I have always been fascinated by creating work from which it is possible to identify the time when it was made — a visual marker for time, if you will. I hope that in the future you will be able to tell when my work was made through the events and people it references. I also seek to ‘place’ my work through my use of materials. In the case of the work for the ‘Drawing Threads’ show, all the materials were recycled clothes or sheets bought locally. By using these materials I am able to intrinsically link my work to the place where it was created. You recently had a solo show, can you talk about the work in the show and the challenges of creating a solo exhibit? My most recent show ‘Surface Tension’ is a natural extension of the ‘Home Invasion’ series which started in Australia. Ever since creating those pieces, I wanted to explore the idea of placing them in an installation — to create an entire room which supported the concept. I wanted to create the idea of someone’s sitting room (in the UK, people used to have a ‘sitting room’ which had all the best furniture in it, and was a place where you received guests who wouldn’t be allowed to see the rest of the house!) I wanted the viewer to be lulled into a false sense of security by the seemingly ‘homely’ feel of the room; to be invited in; and it was only when you had spent some time in the place that you would notice that it was literally crawling with insects: on the tablecloth, in the cups and sugar bowl, on the wall. One of the biggest problems I had with this show was a lack of time. It was also hard to source the perfect accessories (tables, chairs, wallpaper) in order to create the right atmosphere. Luckily, I feel I was successful in this endeavour. The feedback I got from visitors to the show was just what I wanted. Someone described it as ‘a perfect balance between creepy and cosy’ which I thought was great! 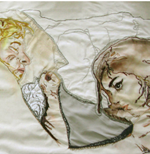 How does working with embroidery/stitching affect the conceptual aspect of your work? What drew you to stitching? I love to draw, and to me, a needle and thread is just another way to create line. I also can’t explain it, but the process of stitching; of feeling the needle pass through the material is innately satisfying. I am definitely a tactile person, and the ability to create artwork which can be handled is essential to me. I like how embroidery allows me to create work which can also be used rather than just displayed; and how I am creating something which will last the passage of time and tell a story in the future. One of the big reasons I use found linens is that I like the idea of interacting with stitches which have already been made; and elevating these pieces above their original purposes. I like to think how the original creators would feel knowing their work has been displayed in a gallery! After all, it is their input which has allowed me to start a dialogue — and who knows how this dialogue will continue long after I am gone? By using embroidery I am also making a conscious decision to perpetuate a craft technique and to make it more relevant to today’s society. It is criminal that crafts are dying out every day as people show less and less interest in them. Where would we all be if we lost the ability to create? I have several ideas swirling around my head at the moment — I have been exploring the dichotomy between tattooing and embroidery for a while now (Needled I and II are an example) and the piece I am currently working on references this through the use of tattoo like imagery. I am also challenging myself with scale and want to explore the idea of decoration through use of colour and more solid areas of stitch. I feel that I struggle with finding my ‘style’ and this latest work is an experiment to create something which I feel is very ‘me’. Tell us more about your project Guerilla Embroidery? What makes it Guerilla? What does the workshop and teaching aspect of this project add to the idea? The idea of ‘Guerilla Embroidery’ really arose from my way of using a traditional technique with modern imagery and concepts. I like to think that people will expect something different from me as a result of the name; and that my work reflects this through its subversive nature. Although it wasn’t a thought at the time, the name also quite nicely fits the way I approach my teaching as well. I have some very strong ideas about education and the role that the arts and creativity should play in the curriculum that some might call radical. It also helps that it isn’t a surprise when a tattooed, pink haired person turns up to do a school workshop either — it’s all in the name! I touched upon this idea previously when I mentioned how I struggle to find a ‘style’. I have often reflected upon the fact that artists who have a clear marketable identity often do better than those whose identities are undefined. I oscillate wildly between totally believing in myself, and completely doubting the strength of my concepts. I find operating on my own quite a struggle sometimes and I miss being part of a studio atmosphere and how experimental it allows you to be. I also find it hard sometimes dealing with pre-conceived ideas from the ‘art world’. I was at a networking event recently and asked someone from a certain Arts website if they represented all types of art. When I told her I was a textile artist, she said ‘oh yes, we do have crafts on there too’. It is attitudes like this that make it hard for people like me who straddle both ‘art’ and ‘craft’. My art would be nothing without my craft, in fact, I owe it everything: but I am still an ‘artist’. I just choose to use needle and thread rather than paint and brush. I work part time teaching Art to Young Offenders, which is an amazing job. I love it, and feel very lucky to be able to say that. Some artists teach because it is an additional income; I teach because I am passionate about it and the effect it can have, especially on vulnerable and hard to reach young people. I also run a Saturday morning Art group for students aged 11-16 at a local Arts centre. Currently, I am part of a new group called TEA (Thinking, Expression, Action), which has been set up alongside the ‘Campaign for Drawing’ in response to the latest OFSTED report on Art and Design in schools. The end result to this being to create new resources which can be accessed nationwide and which tackles using drawing in new and innovative ways in the classroom. I am also currently obsessed (OBSESSED) with quilting. I am definitely envisioning ways I can combine this with my embroidery in the future. When I got back from Australia, I set myself the challenge of having a solo show every year. I have managed to do this so far, but it has meant that I have less time to develop new bodies of work. For this reason, I plan to spend 2013 creating and exploring new ideas. However, I am always looking for new opportunities, so who knows what group shows might feature my work next year? In the meantime, you can see my work on my website: http://www.guerilla-embroidery.com and see more work in progress (and my other projects, including TEA and teaching/ workshops) on my blog: http://www.guerilla-embroidery.blogspot.com . You can also follow me on twitter (@G_Embroidery) and on Instagram (GUERILLA_EMBROIDERY). The tea-set from ‘Surface Tension’ will be for sale at the Design Shop, Dean Clough, Halifax, UK very soon. Thanks, Terry. Cannot wait to see how her new work develops. Next Post Next Post: NSFW Saturday – Megtastic’s Wine Cross Stitch!